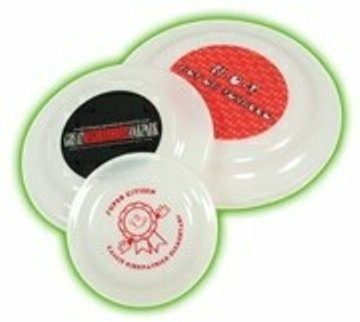 Custom Mini Frisbees -Flying Discs, Personalized in Bulk. 5", Glow-in-the-Dark and Matte. Promotional, Inexpensive. Lowest prices in the USA and Canada. 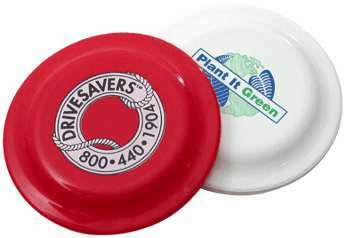 Bulk personalized mini frisbees, customized with your logo or message. Great for advertising during outdoor events. The standard 5" mini frisbees are made of matte polypropylene plastic, while the glow-in-the-dark flying discs are made of a plastic luminescent material which glows at night. Free artwork design. Lowest prices in USA, Canada for bulk personalized 5 in. frisbees. American clients pay no taxes. The unit prices below include your 1-color imprint on your mini frisbee. We also supply blank (not custom imprinted) 5" frisbees for EQP (End Quantity Pricing): minimum quantity: 250. Standard Production: 7-10 days after art approval.